Got a chance to try this out a couple of weeks ago. It costs $30 to join, $15 if you offer a spot to boondock. Basic idea is to have a network of individuals providing free boon docking. We were in the Tampa, FL area, it was a weekend night. Most campgrounds are full, KOA had a site for $112 for one night. No thanks! We parked in someone's driveway. They provided water and 15AMP electrical. As you can see, we parked in their driveway. From here, we headed to Cedar Key where we got a nice campsite in the county park there. Great idea. Not sure if id personally want someone camping in my driveway but for those who have the extra room it could help with some extra income. No extra income, almost all are free. Some have a nominal charge for electricity. I don't believe that Boondockers Welcome is a money producer. I think the idea is that of just being a welcoming neighbor, and if you are a member, you can get a reciprocal welcome when you are traveling. I've not joined Boondockers Welcome, but was a member of Warm Showers for a number of years. It is similar, intended for bicyclists. In the case of Warm Showers, you can offer just a place to pitch a tent, most often with kitchen/bath privileges and water/electric, or a spot on a couch or spare bedroom. You can set some guidelines such as length of stay, amount of notice required, pets welcome or not, etc. I had a GREAT experience with Warm Showers, met some fantastic folks who stayed with me, and I am NOT in a popular tourist area. Also, Warm Showers allows you to write a review of guests, and allows the guests to write a review of hosts. This works to provide some feedback for others when making their decisions on staying or not and whether to host an individual or not. Adds some peace of mind. No idea if Boondockers Welcome provides the same service. I'm glad I saw this, I will be joining as soon as I am home from my Snowbird trip to Florida next week. I’m somewhat in the same place. I have constructed a campsite accessible from my driveway with water hookup, 30 amp electrical service, and a TV antenna feed. It would have a sewer connection except that the septic tank is on the far side of the house. And I could actually accommodate two trailers. The limiting factor is length (maximum of 21 feet???) as my driveway is somewhat tight. While I have offered/allowed its use to friends and other people I have gotten to know, I’m not sure I want to take calls from “total strangers” looking for a place to stay. 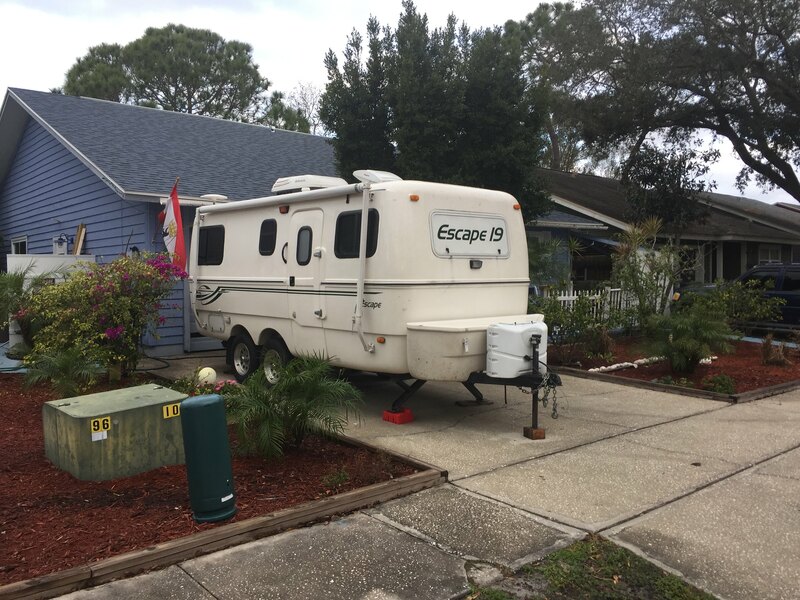 Being in a quiet, rural area somewhat close to Tampa, I’m sure I would have no shortage of “guests” during the winter months as campsites are not always easy to find in Florida when frigid temperatures result in the annual snowbird migration. But at this point, I am hesitant to commit to Boondockers Welcome. Anyone considering hosting campers at their homes should be aware of their HOA rules, deed restrictions, etc. regarding people living in campers on the property. It is often not allowed and could subject one to fines. I’m sure I would have no shortage of “guests” during the winter months as campsites are not always easy to find in Florida when frigid temperatures result in the annual snowbird migration. Many only allow short visits. In the case of the one I stayed at, the limit was one night. So its not a replacement for snowbirds, its more of a passing through the area or waiting for your campsite to be available. Yes, check with your local government first for any special rules. I too have a narrow driveway, with a tight turn, to get to the backyard. Once in the backyard, I have ample parking. Its getting back there that is the problem. I barely make it with my Escape 19. Don't think I could make it with a 21. I have toyed with putting in a second driveway, with better access. Putting it in would not be cheap, lots of dirt to move, retaining walls to be built and more. I checked it out this morning and I will probably join but as I may be going away this summer I will not become a host till next year. I live in a rural area and have sewer hook up and just a 15 amp service but I see the few I looked at they also only offer the 15 amps. So I would have to pay the full price to become a user of the service or I may ask if I intend to become a host after the summer when I am back in town, if there is a problem in getting the discount now. Also I was looking at one "Host" site and to tell the truth, there would be no way anyone would book at that location, Site was small, and looked like it was built on a side hill, no amenities and all restrictions, so all it was, was a place to sleep IF you could get it level. I have to wonder if this person just became a host to get the discounted entry price. What about liability issues incurred by the host and or the guest? Having read their website I consider this to be a really bad idea. You will be inundated with freeloaders just for starters. It NEVER works out when people get something for free and in this case the only ones reaping any rewards are the Boondocking dot com people. I dare you to discriminate as they advertise! See you in court! My family having had the privilege of owning a Motel and a Hostel for many years and my having Full Time RVed for 9 years, I can without hesitation say you are opening yourself up to every walk of life and every trial and tribulation imaginable. Don't disillusion yourself and think every boondocker out there is that spanking clean photo shown in their ads. Those are the minority. However, if it's the variety spice of life you're missing and liabilities like you wouldn't believe, this may be for you. Carefully read Boondockers web page. They take the money and dump the rest on you. Hey just saying, in cases like this remember, NOTHINGS FREE and If it's too good to be true, well .... see you on Judge Judy! IMHO of course. We all have one. You or Me??? Someones ALWAYS got to pay. Them: Hope the Host has the proper insurance to cover when, for example, they "just bump" into your camper, their dog bites you or you trip over that missing paver they meant to replace 3 years ago etc. You: The same applies to you. You'd better check with your insurer to see if you are covered in this "Free" activity. Boondockers accepts no responsibility, period. Yep, I with you on this Roger. I'm with Roger, this looks like it could be a can of worms, or worse: a can of bees! You would need a lengthy contract specifying various modes of acceptable and non-acceptable conduct including behaviors such as the use of alcohol or recreational drugs. Bad mannered people will sign your agreement and then simply ignore it. Another biggie would be any impact on your homeowners insurance. If someone planned to host one of these boondockers, they'd better go over their homeowners insurance policy with a magnifying glass and a fine-toothed comb. We like to think people, especially RVers are reasonable people similar to us. Imagine a boondocker running his generator all night, or a couple arguing loudly all night and having it end in homicide? Very unlikely, sure, but impossible? No. I can't imagine having to confront a non-paying, temporary resident, in my driveway about his, his family, or his pet's noxious behavior. A lot of people care about the impact they have on others, bad mannered people do not. Hosting is a lot of risk for ZERO dollars. As for being a boondocker with their system, I'd rather pay than risk a crappy experience with someone who is hosting just to save a measly $15. Where I live people regularly go out of their way to help each other, and it's not looked at suspiciously. That's not to say you don't make points worth considering, but I'm sure glad I don't live in the same scary world as you. Sounds pretty stressful. I've never used it but I've looked at host sites and read reviews. Similar to couch surfing and other services. Sure, you can get screwed, but it seems like most people don't have that experience, and yes, most are free. Gerry that is absolutely true. A friend of mine is a host, because he had to be a host to join. He wrote the description to purposely discourage people from using his yard. "no connections, one night maximum, 17' or smaller trailers, possible trailer damage due to tight turn off a busy highway"...All true, but he admitted he was hoping to limit guests. He's a very good person and good friend. But not perfect, like the rest of us.